Unlimited Web Hosting – What’s the Deal? I’m sure you’ve all seen the term unlimited web hosting, but what does it really mean? Is unlimited hosting really unlimited? The term unlimited, in the web hosting world, often refers to disk-space and bandwidth. Unlimited Disk-Space means that you can host an unlimited number of files on your web server – this is especially useful if you’re hosting a blog or website that includes a large amount of photo or data uploading. Unlimited Bandwidth can sometimes be referred to as unlimited data-transfer and encompasses the amount of traffic you receive on your website. If your website is very popular, or you’re running a large eCommerce store which engages a lot of users, unlimited bandwidth will mean that your website won’t become overwhelmed with the large number of users visiting it, and it won’t crash or timeout. The issue with unlimited web hosting is that unlimited doesn’t always mean that there are no limits. The technicalities behind it differ from web host to web host, however, unlimited usually means that the limits are so high, that no user will likely reach the limit. A fabricated example of this would be that an average web hosting customer would use 5GB of disk-space on their server, so an unlimited package would allow you 100GB of disk-space (something which would never be a reality). But remember, every web host has its own limits; it would be wrong to assume that they’re all the same. So, you’re probably thinking, just choose a web host who provides an unlimited package at an affordable price? This isn’t always the best option. Yes, there are some great web hosts that provide unlimited hosting packages at affordable prices, with other great features, excellent customer service, etc. but unfortunately, it’s not a blanket deal – never assume anything when it comes to web hosting. In fact, all hosting companies have their own limits, whether this is stated by bandwidth or in some cases they even state the number of visitors that your account is limited to. For example, SiteGround (our # recommended host) does exactly this. There are many unlimited web hosts offering great deals; which one to choose can be a complicated matter, but it doesn’t have to be. Choose a web host that has a good reputation, who offer a free trial, or a money-back guarantee. This way, you can experiment with their features, their performance as a web host for your website, their customer service, and at the end, if you don’t like what you see, you can get your money back. Remember, if you’re trialling out a web host, cancel your trial before the trial period ends, otherwise you’ll end up paying more that you most likely won’t get back. Check out reputable web host reviews, like us, who cover all of the basic and advanced features of a wide range of web hosts, including performance, statistics, and an honest tried and tested opinion. Luckily, there are lots of resources that can be used via your web host, if they provide them, or using outside sources in order to optimise your website. A great example here is CloudFlare CDN; CloudFlare blocks unwanted and ‘bad’ bots from accessing your website, therefore reducing your server usage. If you’re hosting a WordPress website or blog, WordPress offer many great plugins that can help to optimise your website. Another handy tip for image-heavy users is to use an image compressor, such as, TinyJPG which intelligently compresses your images to ensure there is no loss of quality whilst compressing the size of your images into smaller file sizes, therefore reducing the amount of disk-space used on your server, and loading times for your website users. As well as unlimited disk-space and unlimited bandwidth, web hosts offer other unlimited features. Generally, most websites won’t require unlimited databases, purely on the basis that they don’t use them. However, websites like WordPress do use MySQL databases; these users should be especially mindful when looking for web hosts with unlimited databases. 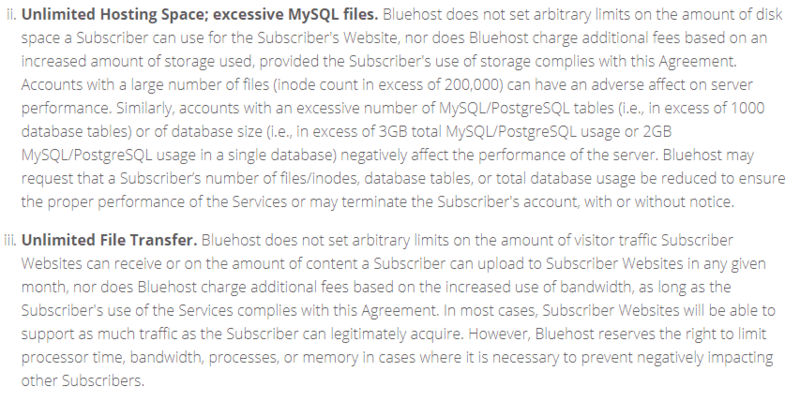 If a web host limits you to 1 or 2 MySQL databases, this may be a problem for your WordPress website, especially if you’re looking to integrate your website with a forum, a shop, etc. as each ‘integration’ will require a database. So, unlimited databases could be a priority when looking for a web host, depending on the type of website you are hosting, and whether it’s a static or self-hosted website like WordPress. Are you looking to host multiple websites on one hosting package? If the answer is yes, you may want to look out for a web host that offers unlimited domain web hosting. Terminology in the web hosting world can be very confusing, and what it says on the tin doesn’t always represent what it actually means – sorry, but it’s the truth. Unlimited domain hosting means that you can host multiple websites onto one hosting package; it doesn’t mean that you’ll receive unlimited domains. If you plan to host multiple websites, choosing a web host with the unlimited domain hosting option would be advisable, and most certainly a cheaper option than hosting several websites on different servers. However, bear in mind that if you’re doing this, you’ll also need an unlimited hosting package (inclusive of unlimited domain hosting) to account for the fact you’ll be using more disk-space and bandwidth on the same server. If you’re hosting a website where you’ll want multiple people to have access to your website’s files, e.g. different members of staff, hiring a freelancer, etc. you’ll probably want multiple FTP users so that you’re not handing over your personal credentials to other people. So, if you want other people to help you with your website, find a web host that will offer you unlimited FTP users where you can create custom access to those users. Unlimited web hosting companies aren’t out to con you by saying they’re unlimited when they’re really not, because after all, nothing is truly unlimited. Always remember to check out a web hosts terms and conditions, user agreement, or fair usage policy – this should give you a clear picture of what unlimited really means to each individual web host. Generally speaking, if you’re using your web hosting package for what it’s intended for, and aren’t indulging in illegal activities, then you shouldn’t have any issues. If you’re genuinely concerned your needs may reach a web hosts’ limits in their usage policies, be honest and speak to them beforehand in order to ensure that you are choosing a web host that’s right for you. As long as the other features they offer are worthwhile, unlimited web hosting is always a better option than limited. Remember, most web hosts will offer a free trial or a money-back guarantee, so don’t be afraid to test out a few before you commit.